The GOSPBC supports the Breeds of Gloucestershire Show & Sale held each year at Cirencester Livestock Market. Along with Gloucester cattle, Cotswold sheep, other rare/minority breeds and Poultry & Waterfowl, this is a grand local occasion and everyone with an interest in farming is invited to attend, free of charge. Each year, on a Saturday in early August, the GOSPBC participates in the Breeds of Gloucestershire Show & Sale at Cirencester Livestock Market by organising the show classes for all pedigree GOS pigs and by card grading all entries for the benefit of buyers. Another very successful event with good prices for quality pigs despite the difficult economic times. The quality too was improved with the card grading team of John Lightfoot, Jonathan Crump and Liz Best awarding several Red cards for the first time in quite a few years. With thanks to all those who helped run the event, to vendors, those who came to buy and Jon Pullen who ran the sale, until Sat August 2nd 2014. 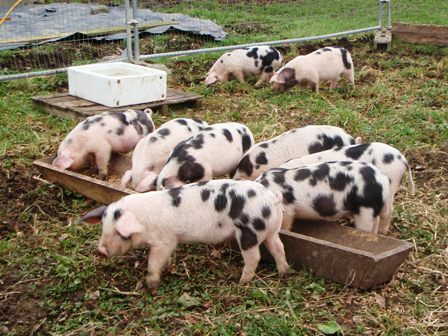 In recent years the auctioneers have expanded the event to include other breeds and crossbreeds of all species but the pedigree GOS reamin the mainstay of the pig section. The event attracts a lot of visitors and good prices have been recorded for good quality stock at every sale so far. An auction sale of this type allows buyers to assess and compare a number of pigs from different herds. The Club organises Card Grading of all pedigree GOS pigs forward so that novice buyers can see how each pig is rated by more experienced breeders (a panel of three breeders award a colour card to each pig including comments on any faults noted). In addition, there is a show held each year, again to help novice keepers. All entries are handled by the auctioneers, Voyce Pullin & Co. (contact details below), and prospective vendors should contact them for a schedule. Cirencester Livestock Market is located on the A417/419 trunk road approximately 1 mile south of Cirencester. The market is just off this road at Driffield (signposted South Cerney; Ashton Keynes; Cerney Wick etc.). The road itself links the M5 at Gloucester with the M4 at Swindon making this one of the most accessible markets anywhere in the country. Click here for a map. Did You Know? The most expensive pig in Britain according to the Guinness Book of Records was Foston Sambo 21, a Gloucestershire Old Spots, which sold at auction in 1994 for 4,000 guineas (£4,200).